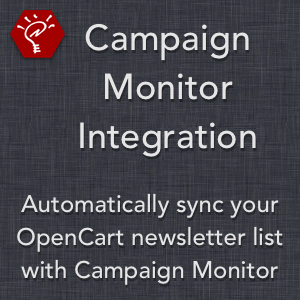 Automatically pass newsletter subscription information from your OpenCart site to your Campaign Monitor newsletter list (and vice versa) behind the scenes, making less work for you! 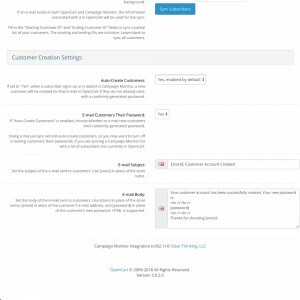 Customers will be synced during standard registration, checkout registration, and when an administrator performs customer-related actions in the admin panel. This extension also includes a normal Module extension, to allow non-customers to sign up to your list. 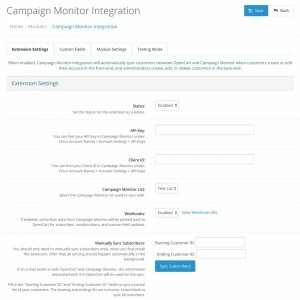 Manually synchronize your newsletter list with a single click when you first install the extension. 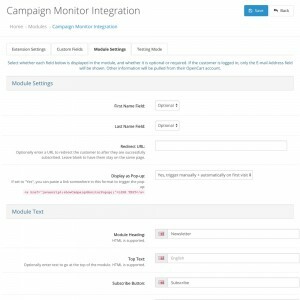 After that, all information will be synchronized automatically in the background. 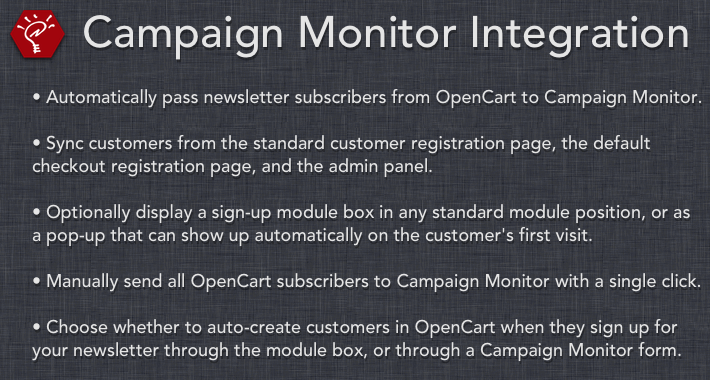 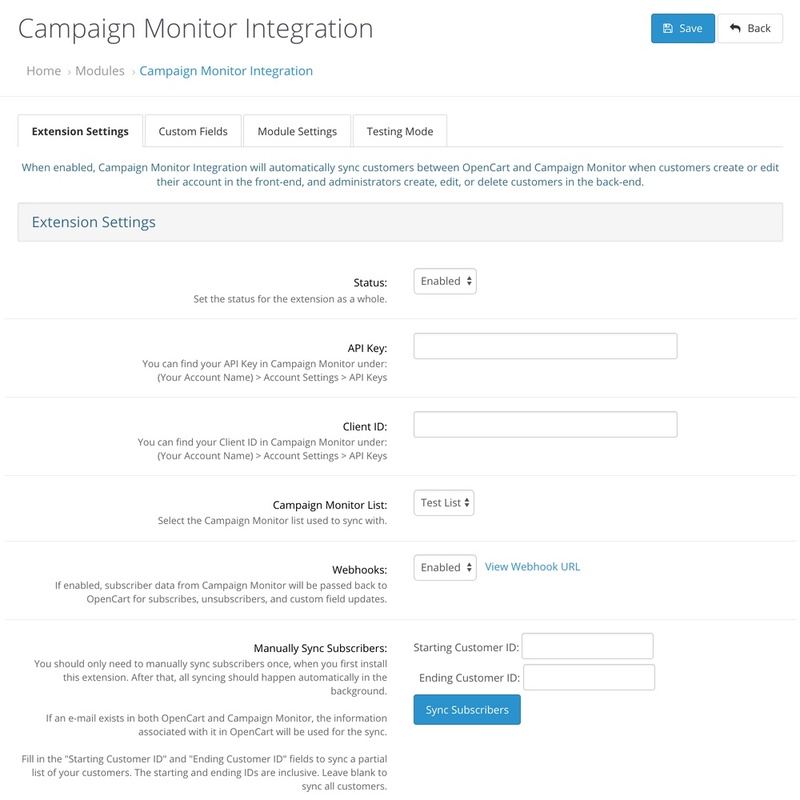 Customers will be added to your Campaign Monitor list when they choose to receive your newsletter in OpenCart, both during account registration and any time after. 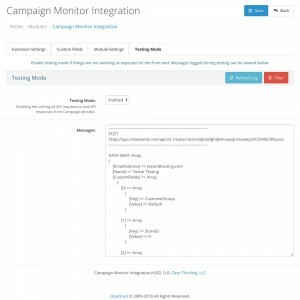 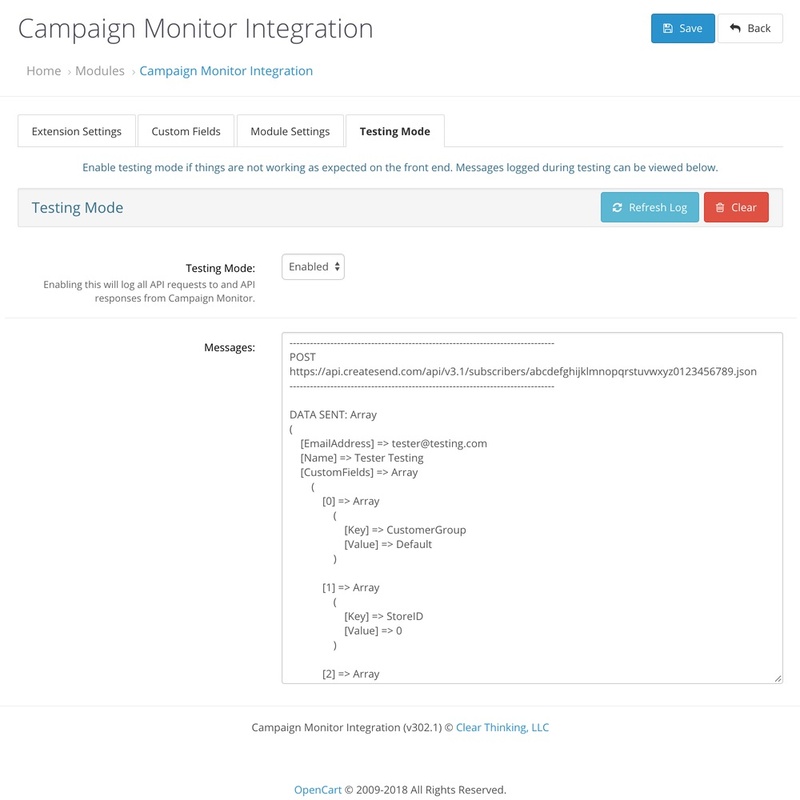 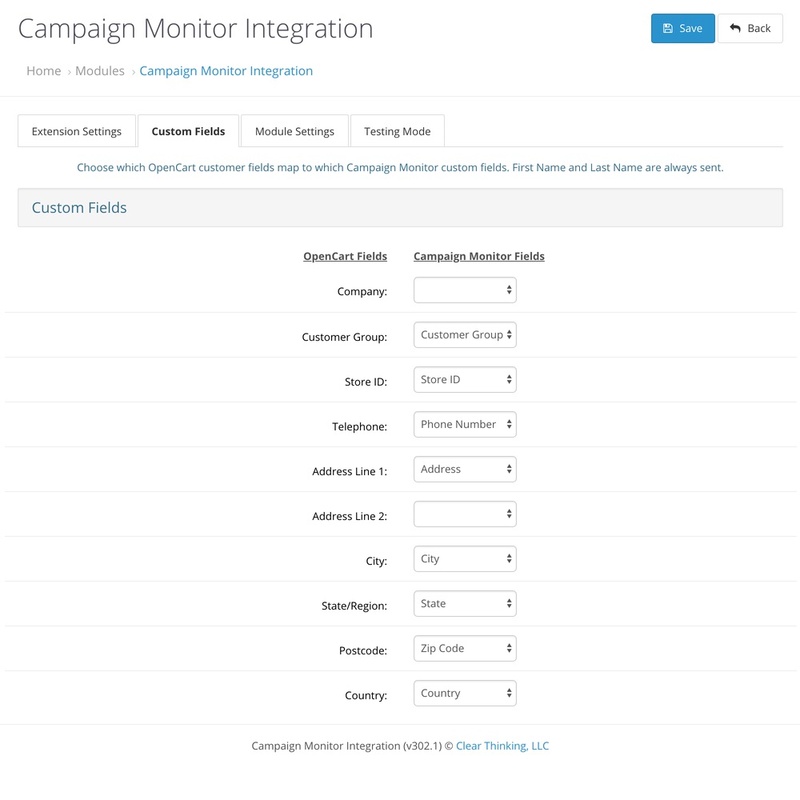 Easily synchronize e-mail, name, customer group, store ID, address, and phone information with Campaign Monitor when customers edit their info in the front-end, and when administrators edit it in the back-end. 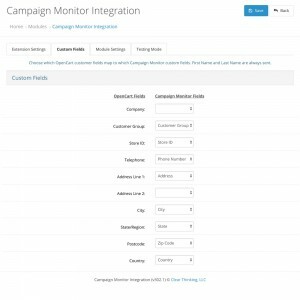 You can then use this info to segment your list to target certain customers when sending newsletters in Campaign Monitor. 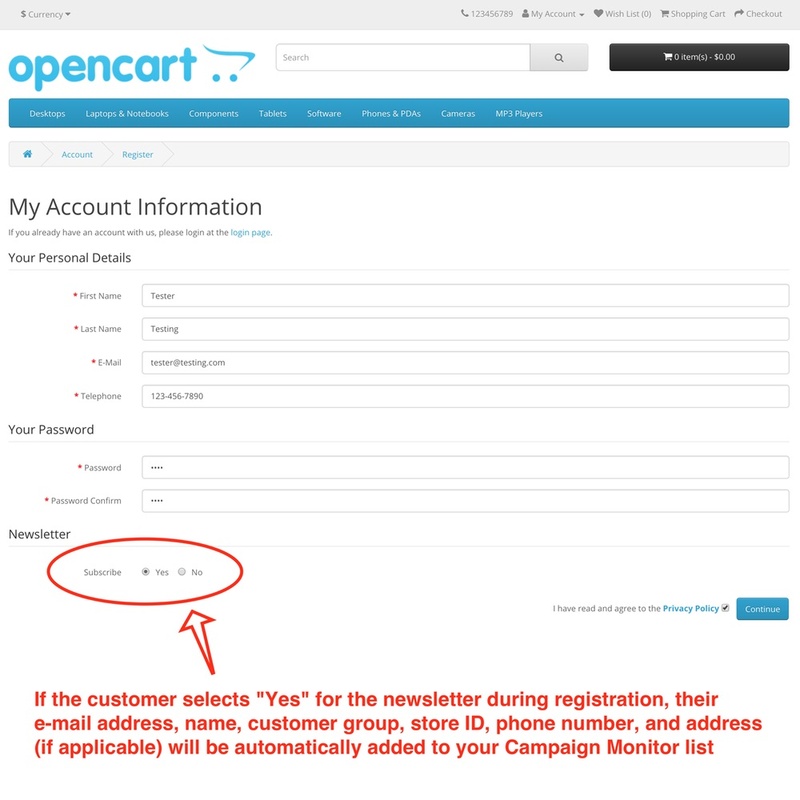 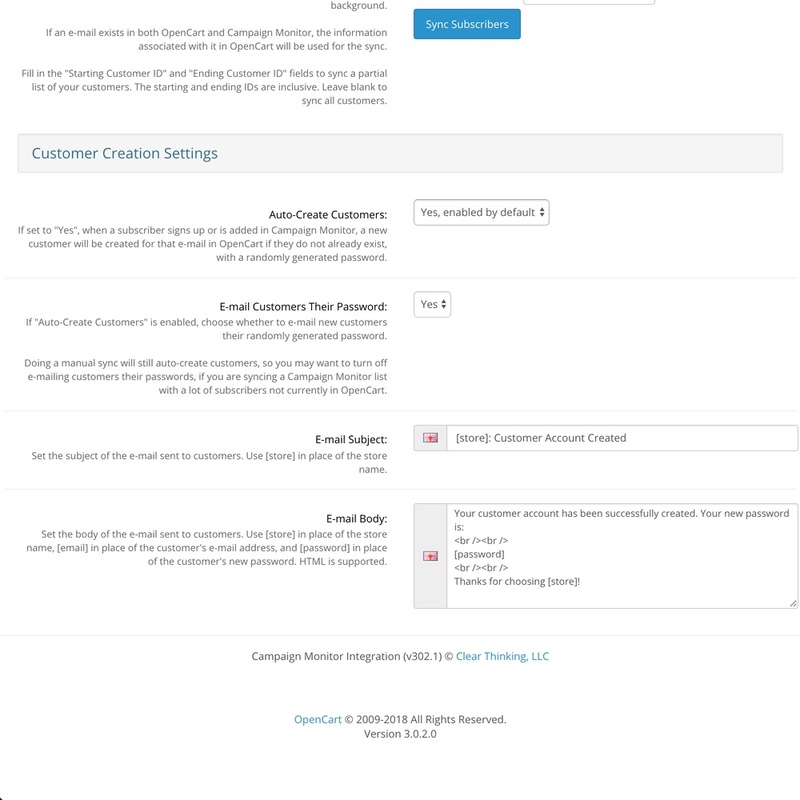 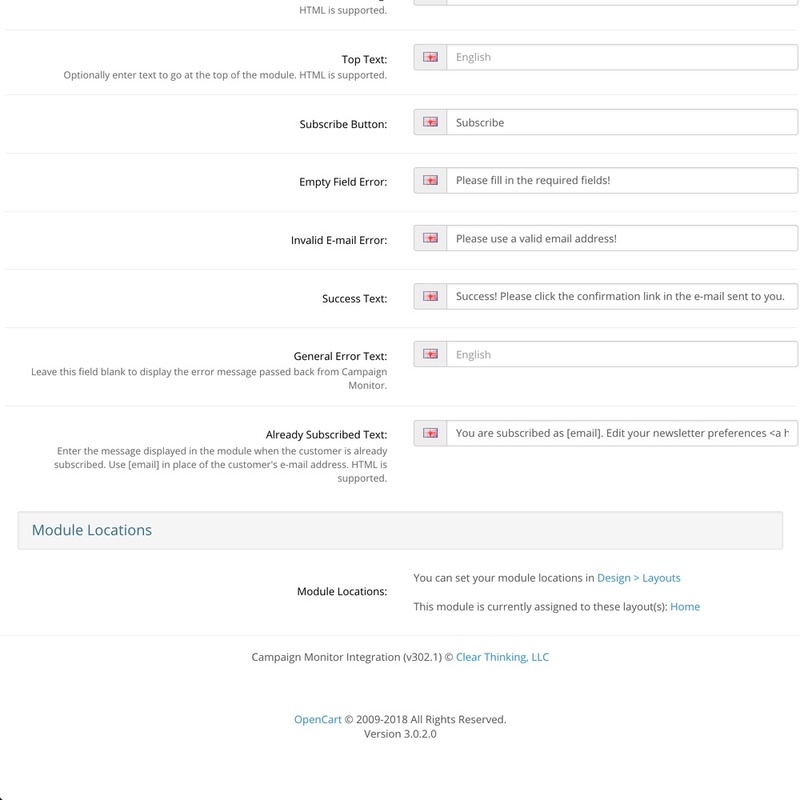 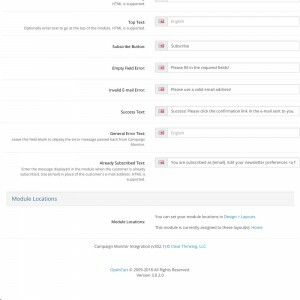 Choose whether to auto-create customers in OpenCart when they sign up for your newsletter through the sidebar module or through a Campaign Monitor form. 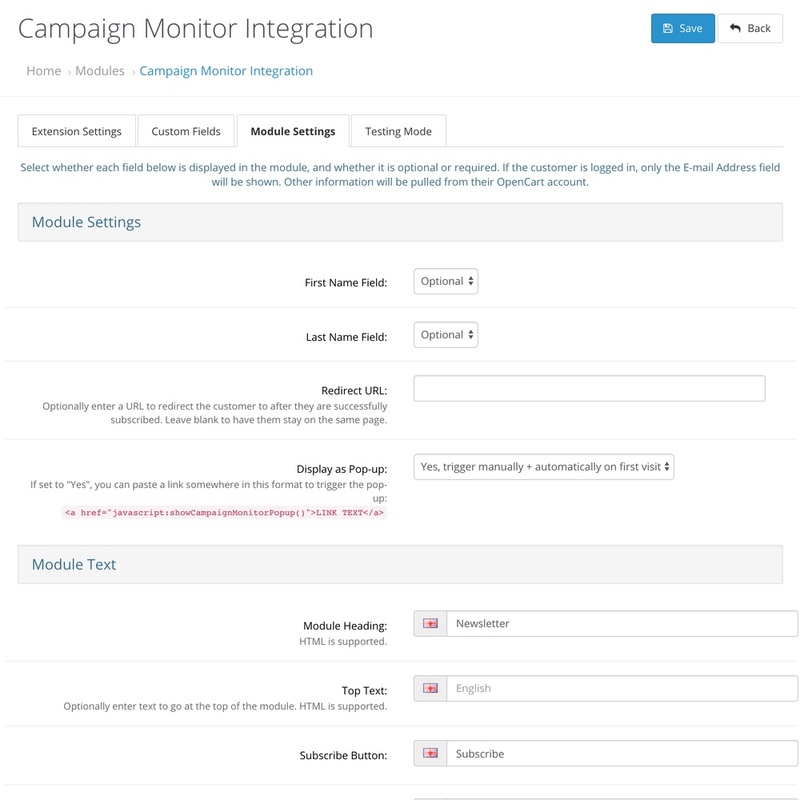 Subscriber information is passed back from Campaign Monitor back to OpenCart using the webhook functionality built into the extension. 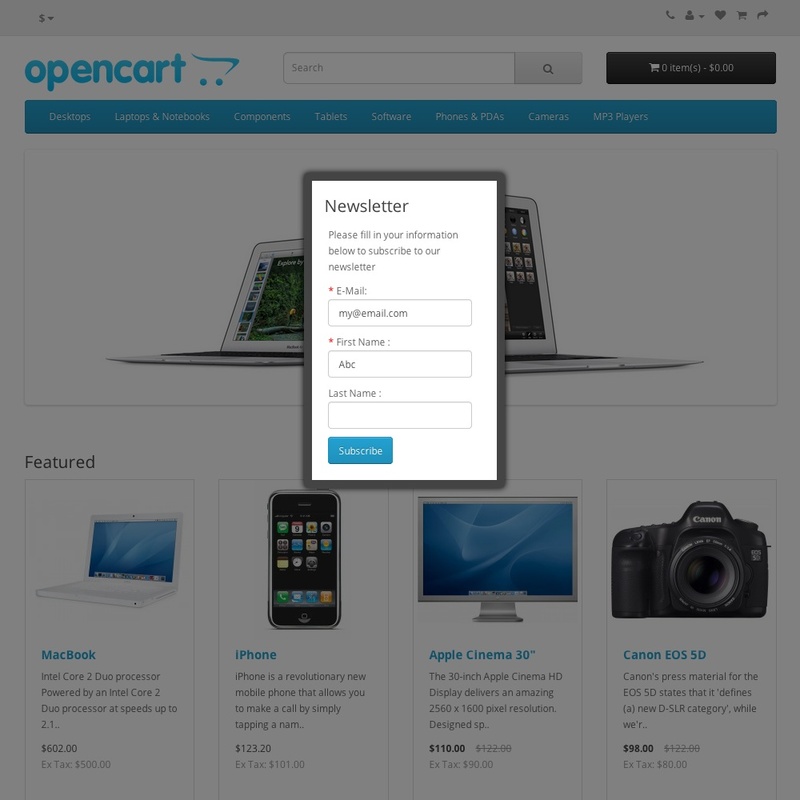 The 5th screenshot of this extension demonstrates a modal window to register for newsletters. 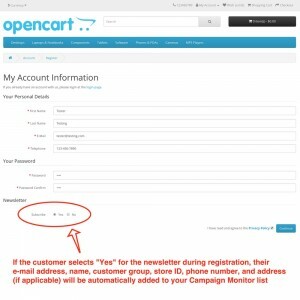 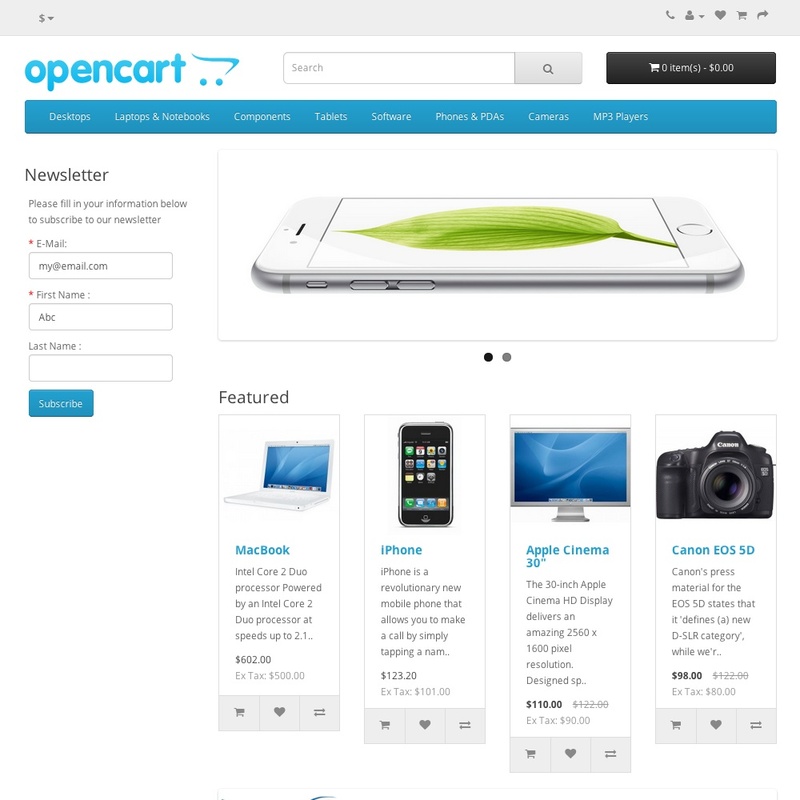 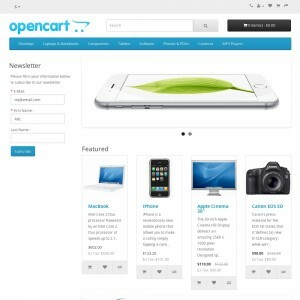 Although, since Opencart also provides the option to customers to either receive newsletters or not from their customer / affiliate profile, those preferences should also be verified.